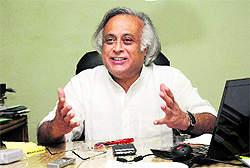 Union Rural Development Minister Jairam Ramesh recently piloted the landmark Land Acquisition Bill that has evoked mixed response among farmers and industrialists. Ramesh spoke at length to Raj Chengappa, Editor-in-Chief, The Tribune Group of Newspapers, at his New Delhi office last week about the significance of the Bill. Go to Kumaon or Garhwal and you will hardly find a village that has any old houses left. Cement boxes have replaced the beautiful old homesteads made by local craftsmen. This is our season for spring cleaning as we clear up and throw out old rubbish to prepare our homes for the arrival of Lakshmi, the goddess of wealth. In Kumaon, we paint her feet with rice paste to guide her into our homes. In other parts of the country, similar rituals are a part of the preparations for the grand finale of the Indian festive season. There has been mixed reaction to the passing of the new Land Acquisition, Rehabilitation and Resettlement Bill recently. If the farmers think that the Bill is not progressive enough and the industry thinks it is restrictive, then I must have done something right. It is a middle-path Bill. We had to compromise at every step and take various stakeholders, farmers’ organisations, tribal organisations and industry associations along. And most importantly, we had to take state governments and political parties along. The process of consensus building is lacking in our competitive political environment but I am pleased to say that this Bill was passed with universal support in Parliament. It is the golden mean as it tries to address everyone’s concerns to some extent. Clearly, the time was right to replace a 119-year-old law which was draconian and anti-democratic and had created and spawned a large number of land-related agitations across the country because of the manner in which the land was acquired. What is the fundamental shift you have brought through this Bill? The 1894 Land Acquisition Act was amended thrice. I could have also amended the Act the fourth time but the basic structure, to use the Supreme Court’s language in relation to the Constitution, is flawed because it empowers the collectors and the state governments through the institution of the collector to decide what is the public purpose, how much land has to be acquired, where it has to be acquired, what compensation has to be paid and what is the urgency clause. These matters were left to the collector’s discretion and we needed to make a paradigm shift in the acquisition process. What we have done: first of all, the very title of the Bill is no longer land acquisition 2013, it is right to fair compensation, transparency, resettlement and rehabilitation. Incidentally, this title was suggested by Rahul Gandhi. He came up with a very interesting argument. He told me, “Look you called it Land Acquisition Act 2013, but you are facing a lot of opposition to the Act, so why can’t you have a name that nobody can oppose?” I asked him what he meant. He said, “After 9/11 Bush came up with Patriot Act. He could have called it something else but who can oppose a Patriot Act?” That is how we thought of it. The purpose of the Act is threefold — to provide fair compensation, resettlement and rehabilitation, and transparency in land acquisition. These are the three objectives and land acquisition is the consequence of these objectives being met. How did you determine the word fair compensation? We have built into the Act the methodology to be adopted for determining what fair compensation is. It is four times the compensation in rural areas and two times in urban areas. It is not based on the circular rate alone as this is a very artificially depressed value of land. So, we have said that you take the last three years and you take the highest sale deeds for the past three years and then you take the average and compare it with the circular rate. If it is higher than the circular rate, four times will apply to that, or two times, as the case may be. What about rehabilitation and resettlement for the displaced landowners? Along with compensation, resettlement and rehabilitation (R&R) is the heart of the new legislation. In the last 60 years, particularly in tribal areas of Jharkhand, Odisha, Chhattisgarh, Madhya Pradesh and Andhra Pradesh, over three crore tribals have been displaced because of irrigation, power, mining, railway and highway projects but they have not got proper R&R. This added fuel to Maoist propaganda that you are being dispossessed by the government that is heartless and insensitive. One of the reasons for this is that we have lacked legislative framework for R&R and it was left to policy making and policies that was an anaemic-anodyne type of a document. We have put R&R into the body of the Act and have defined the 20-25 different activities needed for the process. Till that starts, the process of land acquisition is not deemed to have been completed. Industry is saying that the higher costs will be a disincentive. The cost of land to the proportion of project cost is only about 5 to 6 per cent. Industry is exaggerating the financial cost of increased compensation but I admit that the financial cost of acquisition will go up. 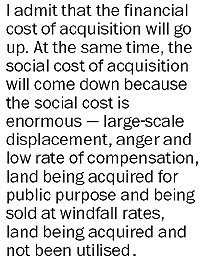 At the same time, the social cost of acquisition will come down because the social cost is enormous — large-scale displacement, anger and low rate of compensation, land being acquired for public purpose and being sold at windfall rates, land being acquired and not been utilised, land being acquired for public purpose and sold to private companies, land being acquired and government squatting on that land for 20 years, and much more. We have seen all these things during the last several decades. Firstly, the new Act provides a new deal to a landowner. Secondly, it is sensitive to the anger in tribal communities. Thirdly, going by the Singur experience of West Bengal, for the first time we have included landless and livelihood losers as beneficiaries of compensation because when land is acquired, it is not just the landowners who lose but there are local communities who depend on that land for some occupation or tenant farmers or informal sector. So, they also have been brought within the ambit of compensation. The other concern is that all this will considerably slow down the process of land acquisition. This does not speed up the land acquisition process but makes it more transparent. The time line would be anywhere between 36 to 40 months if you go through the processes enumerated in the Act. There are four main components in the Act. There is a consent clause or component under which without 80 per cent written consent of farmers, you cannot apply land for private companies, or 70 per cent for PPP projects. There are components for compensation, R&R and SIA (Social Impact Assessment). There is a timeline for each of the acquisition activities and in the long run it will make land acquisition less contentious. Today, land acquisition is very acrimonious. The idea has been to somehow ensure that land acquisition does not create the type of agitations that we are seeing. Where does it leave the change of land use rules? The change of land use is entirely the prerogative of the state government. This Act is for land acquisition. It is not for land purchase, which is still a bilateral transaction between the buyer of the land and the seller. It is not a law for land use. Land purchase will remain a bilateral transaction and land use will continue to remain a prerogative of state and municipal governance. What are the safeguards against the misuse of provisions? There are penalties that have been provided in the Act but at every step, the entire process to determine the Social Impact Assessment is a public process and not a private one. We have put everything into the public domain. What is the public purpose, how much land has been acquired, do you actually require that much land, what do you intend to do with it; these questions will be addressed as part of the assessment and will be available in the public domain. Is there any mechanism in place for the government to make a social impact assessment? There are lots of institutional changes that will be required once this Act comes into force. Institutional changes at the Central and state levels would be needed. We are drafting the rules and will soon make these public and invite comments. All these questions will be addressed, but yes, the institutional capacity will be a very important factor. The Act is almost five times the size of the old Act. We wanted to put everything into the Act and not put everything into the rules, or leave it to the guidelines. This is how the misuse starts. We incorporated it into the Act and if you want to do anything, have the political courage to get it amended. Both the Centre and state governments already own plenty of land. The government is the biggest squatter of land. In the last few decades, Central and state governments have acquired so much land, much beyond what they have been able to use. In my view, if they follow an intelligent policy, you need not acquire more new land. You can give whatever land they are sitting on and not using. This will ease the shortage of land that we have in our country and you are right, we should not blame only private industry for squatting of land. How would you sum up the Act with regard to what it would do to the entire process? 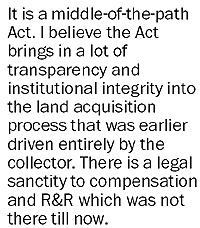 I believe that it brings in a lot of transparency and institutional integrity into the land acquisition process which was earlier driven entirely by the collector. There is a legal sanctity to compensation and R&R which was not there till now. It is a middle-of-the-path Act and I would be very happy if 20 years from now, this Act does not exist. We should not wait for 119 years for another Act because 20 years from now our land records should be modern, the farmers must have adequate bargaining power and if private industry wants land, it should go and buy it. If the government wants the land, it should buy it. My vision is that all land transactions must be bilateral in nature. But today that is not possible because of land records and fragmentation of landholding. This is a transition period. The other major programme of your ministry is implementing the Mahatma Gandhi National Rural Employment Guarantee Act (MGNREGA). How has that performed? The MGNREGA has brought enormous benefits. One in four rural households has got employment under the scheme in the last seven years, community assets have been built and distress migration has come down in many pockets. In fact, Northern Railways officials complained to me that their revenues are down because of decline in migration from Bihar, UP and Odisha to Punjab and Haryana for agriculture. Agricultural wages have gone up. That is very good because agricultural wages is the most important determinant of rural poverty. But overall the implementation is still patchy. In states like Bihar, Odisha and Jharkhand, even UP, where the demand should have been the maximum, it has been very poorly implemented. In the federal scheme of things, we provide the money, do the evaluation, monitoring and feedback but we do not get into the implementation as we are not an implementation agency. Coming to the 2014 general election, what would be the big issues and challenges for the Congress? 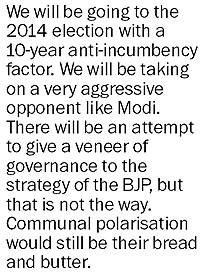 We will be going to the 2014 election with a 10-year anti-incumbency factor and it would be a big challenge for us. We will be taking on a very aggressive opponent like Narendra Modi. I think there will be an attempt to give a veneer of governance to the strategy of the BJP, but that is not the way. Communal polarisation would still be their bread and butter. Modi has certainly created a buzz in the chatterati, so we have to be doubly vigorous in our campaign strategy. Moreover, it will not be just a national election, but a cumulative sum of state elections where local and state issues and problems will also come up. Our strategy is going to be a positive one — what we have done and what will be done for the electorate. We will not run a negative campaign and will focus on issues like the Food Security Act, Land Acquisition Act, RTI, MGNREGA and Forests Rights Act. We need to reinforce the message of performance. How will Rahul Gandhi figure in the scheme of things? He is the manager of our campaign. He may not be our officially declared prime-ministerial candidate, we don’t need to do so. He is the vice-president of the party. His style is totally different from that of Modi, who believes in ‘I, me, myself’. Rahul Gandhi is not autocratic; he is consensual and not a megalomaniac. 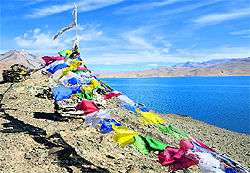 Plastic waste is non-existent in Ladakh. So far so good, but what happens after Diwali should be of greater concern to us. You will see streets littered with the debris of paper from crackers that deafen us each night. Add to that the wrapping paper carelessly strewn and mounds of rubbish outside homes that simply sweep their trash out for someone else to clear and you have a minor avalanche of trash in the country. Among the many aphorisms that Gandhiji gave us, I think the most important one was: Cleanliness is next to godliness. He alone saw with characteristic prescience what prosperity and the Indian propensity for trash non-disposal would lead to. For many years now, I have stopped visiting temples because rather than worship the beautiful idols of the gods inside, I have been more concerned with keeping my purse safe and my feet clear of the rivers of dirt that flow everywhere. So if Modi means what he says — Pehle shauchalaya, phir devalaya — he has my vote. We have just returned from a spectacular road trip through Ladakh and the awesome landscape left us as wonder-struck as are all first-time visitors to this part of the country. Yet, what was to me even more impressive was the near-total absence of plastic waste and the lack of the squalor that has become such a terrible add-on to all pleasure trips in our land. Believe it or not, there were no ‘gutka’ sachets, no plastic bags and — most delightful of all — no empty packets of potato chips and Kurkure! I never thought that there still existed in this wondrous land of ours, a place where plastic has not choked Nature. All along the pretty Ladakhi valleys, we were greeted by gurgling streams of clear water, glorious willow and poplar trees lit up like golden candles by the autumn sun and the bluest skies that I have ever seen. Every village was electrified with solar panels. This makes eminent sense as the strong sun and dry climate is ideal for harnessing sunlight almost round the year. The houses are still made in the traditional style with local stone and mud and studded with pretty wooden windows. Rosy-cheeked children and cheerful villagers wave at passers-by and pose for photos with those who want to capture this land and its people. Once upon a time this is what so much of our Himalayan landscape looked like. Yet, go to Kumaon or Garhwal and you will hardly find a village that has any old houses left. Cement boxes have replaced the beautiful old homesteads made by local craftsmen skilled in dry stone architecture and carpentry. Wood carving was a special art all over the region and rare was the house that did not boast carved window frames and door lintels. Sadly, they are all gone and what is left on broken, abandoned homes has been carted away by antique dealers who sell them for a fortune in the plains. Even more tragic is the ubiquitous plastic waste. The glistening vessels of brass and steel, the hand-beaten copper pitchers for storing water — all these have new plastic avatars that are not just ugly to behold but probably toxic as well. Just as our natural fibres, such as cotton and jute, were slowly phased out by the wash and wear clothes that are easy to look after, we have slowly accepted these as convenient replacements for the cumbersome and difficult to clean metal pots and pans. Ironically, all developing nations follow the same trajectory of grief that the developed world has rejected. We were once the pioneers of organic food (by the way, Ladakh has a fantastic record in producing the best organic vegetables and fruit and the size of their produce has to be seen to be believed) but now we are poisoning our insides with chemical fertilisers and pesticides. And who knows better than Punjab the perils of poisoning the land we till? All this sounds like a dirge but thankfully there is some hope. I have just received an invitation from Gene Campaign to attend their celebrations as they mark 20 years of work. It is engaged in preserving all the seeds that were indigenous to India. They work towards educating farmers on the importance of going back to the natural methods of organic farming and claim that the produce is not just more healthy but the harvests are impressive as well. More power to ventures to save the planet from untreated sewage and chemical waste that our generation has unleashed.